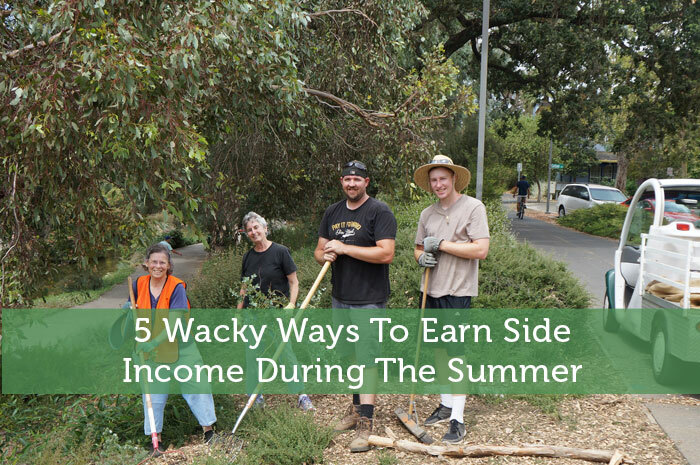 With Summer around the corner, it’s time to think of wacky ways to earn money on the side to make your financial life better. For some this has become a sport in where they try outdo themselves with each passing year. Whether you do this to add additional money into your emergency fund, to pay for home upgrades and repairs or simply for the Annual family vacation – ways to earn extra are what we touch on in this article. We highlight five different and unique ideas on ways to make money this Summer. Anyone can try these and anyone can make a little extra cash if you put your creative cap on, think outside the box and know how to market yourself. The old standby is always eBay. However there’s a new kid in town and her name is Etsy. This is a US based marketplace of handmade items, and the offerings rival that of any major online retailer including eBay and Amazon. You can pretty much sell anything on here so long as you made it, it has to be handmade. This can include graphic design services, blog installs, content and even SEO services. But if you make physical products such as jewelry, knitted clothing, candles, soaps and even furniture – you can sell it via Etsy. They take a small commission per sale, but provide you with many tools for selling including a big, active and highly promoted marketplace. Etsy has been featured on all the major magazines and newspapers and is well known and established in the online retail industry. If you happen to live in a small town without food delivery service. Start one. Contact the most prominent restaurants in town, and let them know you will take delivery orders online and then deliver the product to customers. For a monthly delivery fee – of course. Set up a cool website that allows for online ordering, make it look good but make sure it’s also easy to use. Then take to the streets and sell your delivery service to restaurants. Charge an appropriate fee to make it worth your while and the key here is to get the restaurants to sign up in advance at a monthly fee based subscription. You’ve seen this before, some enterprising individual with a large cooler full of ice cold bottles of water selling to the hot masses while trapped in traffic. Do one better and see if you can do the same at local ball games, festivals and or swap meets. Basically anywhere that lots of people congregate in and someplace where it’s hot. The beach, high school ball games, etc. You might need the permission of event organizers as some will not allow this, while some will. So the trick is to find the events that WILL allow you to set up your water selling booth. This idea I recently spotted on Facebook via my social network. A young family member of mine was advertising his new headlight cleaning business where he mentioned that he would clean, dry and shine your car headlights for twenty bucks a pop. I don’t know about you, but this is the first I’ve heard of this idea. Well guess what? Several individuals took him up on his offer and he made an easy $100 or so bucks with that simple and quick status update. This is my new personal favorite as it is an idea I myself am pursuing this Summer. In my home city there’s a new upcyled material center and they want people to use their gently used items. So what do they do? They’re offering a Woodworking 101 workshop. Brilliant. These are not shabby 1 hour classes, but full fledged 4 week workshops where by the end, you walk away with a side table and a shelf – made by yours truly. The items for use are recycled wood, metal and other construction building materials. Once you learn how to make stuff from wood, you can then turn around sell it. And guess where? Yes, on Etsy. So to recap, above we have five good ways to make extra cash this Summer for whatever purpose you would want the money for. Pick one (or two) of the ideas and enjoy a beautiful, active and profitable Summertime. Guest post by: Missy who owns and writes on Frugal Quack, a fun frugal living blog about living more with less. When Missy is not hustling making a buck online, she loves to run by the Chicago lakefront, run nature trails, hike anywhere and everywhere she can and her favorite – jog on a local beach. Editor’s Note: Thank you for this awesome guest post Missy! Do any of you do stuff like this to earn extra money during the summer? Or is summer primarily your time to relax? I can speak from experience selling furniture is a great way to make some side income. I recommend starting off building for yourself though. Gives you practices and you end up with great furniture! Did you sell your furniture locally or online or how? Would love to hear more. It’s funny you mentioned Etsy… I love that site, but I’ve been finding more and more examples of people who just buy things cheaply on eBay and then turn around and sell the item for 3x the cost on Etsy. I guess it’s buyer beware! Great tips, though. Here’s another one: many colleges hire ushers to help out during graduation. You probably need to be a student or a college worker to be hired, but these day-long graduation gigs can be very good. How can you tell an item came from eBay? This is news to me, but I agree with you 100% on how awesome Etsy is. Lots of super cool stuff there. You’d be shocked at how much those water people can make. They are always outside sporting events. The stadiums allow you to bring in outside stuff and instead of paying $3.50 for a water you pay $1.00. I think it’s quite brilliant and yes, if they go to big events where there’s tons of people – like say a (mega concert) and it’s warm out, I would imagine they would do quite well. You can buy a case of 24 water bottles in many stores for as low as $4, so if you sell each one at $1 a pop – hello, there’s good profit there. Lol. I’ve wanted to start a local delivery service for some time now. The only thing that scares me is the liability of delivering alcohol, etc. With a little moped, it could be lucrative and fun. This idea came about after having spent the last 5 years in a small town where there was no delivery service. Since I have lived my entire life in a big city, this was so not cool, I wanted food delivered to me. Lol. Anyway, also the person I lived with in the small town just happened to own a family restaurant in town. So we came up with the idea to offer a delivery service, except it fell through – because daddy didn’t approve. Not my daddy, but my friends. However I still think a local delivery service is a good idea, especially if you live in a town where it’s not currently offered. I always see people selling water at big events and it could be quite profitable. Good ideas – side hustle! It makes perfect sense and indeed it could be quite profitable, provided you stick with busy areas and you have plenty of stock in hand. These are great ideas. I always sell water at yard sales. Usually it brings in more money than anything else. This is especially good when you are in a community wide yard sale and people are walking around for awhile. Nice. That’s a good idea, too. I have seen people do this and the hotter it is outside, I would imagine – the more you would sell. When I was in Vegas last year, there were a lot of people handing out water for $1-2. It was 100 degrees out and they were selling like crazy. I imagine even with a low ¢.70 margin they still could be raking in around $70-100 a day pretty easily. Absolutely, Paul. The hotter it is outside, the better (and more) profit. It’s funny, some things you can do yourself are things that other people would pay for. Such as making lemonade – people buy lemonade from lemonade stands…but it’s easy to make. Also my BF cleans my car’s headlights all the time. Maybe he should advertise this haha. He has a tool he uses and buys some solution/gunk to rub on the headlights. Bye bye foggy headlights! That’s what a service is all about, doing stuff for others they cant (or wont) do themselves. Someone’s gotta do it. Lol. Hmm I’ve thought about being a beer girl at golf courses. My friends make a ton and they only do it on Saturdays. Drunk old golf men like the young beer girls apparently. Those dirty old men on the golf course, will pay for anything from a pretty girl. Water, beer, nuts, beef jerky. Ha! These are some interesting some income ideas; especially for Summer. I like the idea of selling water the best. It seems to be the most lucrative of all the others. Yes, the water ideas seems to be the most popular. Do try and see how it fares for you? Then come back here and tell us all about it. That’s pretty clever to clean the headlights! I like the water bottle idea too. While I could probably make the time to earn some extra cash, our schedule is always booked up. For us it comes down to whether or not the money is really worth the time. I have to get paid a lot in order for me to justify it. Thanks for dropping by and leaving a comment. Appreciate it. The delivery service is a winner – You could even extend that to doing on-demand deliveries from the supermarket! Right on, that’s another good idea. I for one, hate shopping and will pay anyone to deliver items to me – including the grocer. Thanks for the added idea. We both have posts about side income today. Great minds think alike! Another great place to sell water (or coffee in the morning) construction sites. If you happen to have one by your house, set up shop and we’ll flock to you on our breaks. Coffee/Water at construction sites is illegal to sell, at least here in Ontario. You need a permit, just like setting up a Hot Dog stand, you need a permit. Construction sites are well covered by food trucks, that come and go 4-5 times a day. Good tip about checking with local laws. I don’t know what the laws specifically say around here, but I do know that our work site does NOT regularly see a food truck. In fact, I haven’t seen it since last fall! As Eddie mentions above, it’s always a good idea to check first with owners and or landlords before setting up tent and selling items, as some will allow it – while others won’t. Best to get the go – before setting up tent. I wish I was creative enough to come up with something cool to sell on Etsy. I love the site though, and enjoy buying homemade things from other sellers. My money making idea for the summer has yet to be determined. I’m brainstorming a few things but I like having a 90 day deadline to work with. I hear ya, it’s amazing the creativity employed by some on Etsy. So many good items on there, love love love – the site. I had never heard of etsy.. But I will definitely check it out. We are planning to have a huge garage sale here in a few months. You can’t really sell stuff from around your house on Etsy, like you can on eBay. Etsy is more for stuff you create yourself that is brand new. However you can use recycled materials to create the stuff. For example, some sellers on Etsy will use reclaimed wood to create tables and desks – then sell them. I would be a little worried that selling water may not be the best use of my time. There is an opportunity cost to everything that we do. That would be my only concern when considering side income ideas. These are some great ideas though! Plus you would have to sit out there in the heat for a good number of hours to sell the water. So it really just depends on what one prefers to do and is willing to do – for a side hustle. Lol. Some love this idea, while others prefer something not as out there. These are all great ideas, except the last one, which requires a lot of skill and upfront cost in order to make money, which also happens to be a lot more than the rest of them that would have upfront costs. Thanks for the excellent feedback. The furniture selling idea revolves first around learning the craft, then creating pieces to sell. However one could/should start small. Meaning you would create one piece, then sell it. Create a second, then sell and so on. You wouldn’t go hod wild and stock a warehouse full of your creations – until you can sell a few pieces first. But I hear you loud and clear, you still need to buy the wood. Lol. Sell water is the best thing I read today. I’m sure there is a market for it, but I don’t know if it makes sense or has the greatest ROI. If you can sell water and people will buy it, the ROI is astonishing. I don’t know where you are, but a case of 24/bottles of water costs $2.99, and on a special you can get in for $1.75. Selling the bottled water for $1 each will generate a $21 profit or 700% ROI. I agree with Eddie, water selling is profitable because normally you can buy an entire case and then sell each bottle individually. So there’s definite profit in it. Great ideas. I am going to sell some extra garden seedlings that I have ended up with. I might even sell some extra produce too. I usually have a very fruitful garden. When I lived in the small town that I mention above, my next door neighbor would plant corn (I mean lots of corn) in his backyard – that I’m pretty sure he sold. Because he lived alone and there’s no way that he could eat all that corn himself. Lol. I never got a chance to ask him, but am pretty sure he grew it to sell it. I think selling water sounds like a great idea. If someone is hot and thirsty you could make a great profit on that. Absolutely, Katie. I agree and so do many others here on this blog. I know of an Aussie who makes art out of scrap and then sells it. The stuff he makes is really cool too. I’ll have to dig up some info and do a post on it. @Sire: With the environment and going green on everyone’s mind these days, those who create handmade products stand above the rest. There are tons of blogs and sites dedicated solely to handmade and DIY products. Plus I think they’re so much more interesting then a shelf product in a box store. Awesome post Jeremy! I am going to try Etsy out, never heard of them but they sound promising. The headlight cleaning thing seems to be a great ideal too. I have actually done that myself and it works great, just be sure to get a quality product for use, especially if you are charging someone for it. With these kits, you get what you pay for but $10 should be enough to get you started. How much did you charge for your headlight cleaning gig? Do share more. Etsy is a fun site and because it gets a ton of exposure, I think most sellers do well. Go for it. Set up a shop, then come back here and share the name and URL with us. Would love to see it. p.s I’ve heard one trick to making a shop successful is to have a good amount of listings, so that they show up in the Etsy search. Such great ideas! Can’t believe that guy made that much money just cleaning headlights. I’ve seen people selling water before, and always wondered if you needed some type of permit to do it…especially outside of ball games. I’m not sure how much he makes cleaning headlights, but I would gather that if he does quite a few each week, he makes out nicely. At least enough for college books, going to the movies, sneakers, gas, etc. Selling water is actually a really great idea, especially at beaches and the like. I’m going to be babysitting this summer for extra money — I won’t be able to do much but I wanted to be able to kick start my debt repayment. Glad you like the water selling idea, this one seems to have struck a chord with the audience here at Modest Money. Which means maybe we should write more on it. Lol. I love the idea of selling water and/or pop at local events. We recently had a neighborhood garage sale, and we sold cookies, water and pop at our sale, and made some decent money doing so. We also have local festivals/events at a park near my parents house, and you can make some good money selling water there on a hot summer day. I also like the idea of being a referee for summer sports if you’re just looking for some side income for the summer. Depending on how much you ref, or your experience, you can make some decent side money reffing. That’s a good idea to sell drinks and snacks at a garage sale. When people are out browsing the garage sales they might want something to drink or snack on, but are in too big a rush looking for good deals to stop at a store. I was also a soccer referee back when I was in my teens. It wasn’t a lot of money, but it was pretty easy work to just run around a field watching a soccer game. I’ve got to hand it to you…these ideas are out there. Etsy takes quite a bit of dexterity to make a product that people would buy. I wouldn’t say that it is a viable option for everyone. I think one really great way to make money on the side is tutoring. I started tutoring right when I got out of college…it’s pretty easy money if you are tutoring 8-11 year olds. I’d be one of those people who has no chance of making money with something like etsy. Some people might have those skills and had never thought of trying to make some money from it. For me tutoring would’ve been a lot more up my alley, but I kept myself busy with less productive things when that would’ve been more viable. I, too, love the water selling idea. I thought of this on my own today and thought I was onto something unique! Guess I’m not the only person who balks at paying $1.50 for something you can get for 30 cents at Target. LOL Now those are some great profit margins! Yes it is quite tempting when you see how cheap you can get a flat of bottled water and how much they charge for those individually. The most rewarding website I’ve found is Swag Bucks. You earn digital dollars for doing simple tasks like watching videos, playing games, taking surveys, searching the web, the list goes on! Your swagbucks can then be redeemed for gift cards, electronics, jewelery, etc. I hope this was helpful! Only available to US, Canada and UK. I have seen a lot of bloggers promoting swagbucks. I am just skeptical about any online system like that. The amount they pay you for your usually works out to child labor rates.